Stevie Wonder, Will.i.am, and other experiences from Salesforce.com's annual Dreamforce conference. With Will.i.am in the front row of Salesforce.com, I felt the conversion. 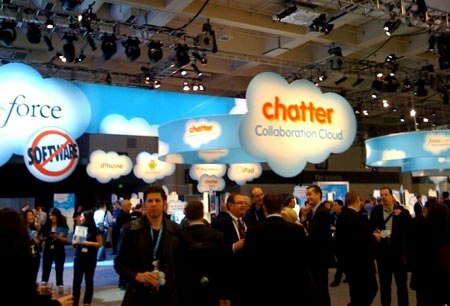 Salesforce continues to surge as adoption rates for On-Demand solutions grow. But more has been done—more proven. Last year’s Chatter introduction demonstrated the use of Social Networks, document sharing, and business applications on all the platforms. The business application world goes apps, though, is something more for solutions providers to think about—as in selling their business solutions in consumer markets. Windows did this a very long time ago with Windows XP Home Edition sold at Walmart et al. And here is the new way we will see business applications delivered. Chatter and Apple. Coming in February, you can have the genius bar people put Chatter Free on your phone, pod or pad. It’s a great strategy to get on as many platforms as possible! Not everyone will be able to leverage this type of approach to markets. But as the diversity in work styles and the way we work continues to change, we will see a lot more of this approach.